"Ireland will never be the same after Rawhead Rex, a particularly nasty demon, is released from his underground prison by an unwitting farmer." I'm sure the more astute of you will have noticed a pattern forming over the last week, or at least you would have done if I hadn't replaced "Wishmaster" with "Phantasm II". I didn't plan it, but I seem to have been picking out a lot of movies for Hallowe'en which are about releasing demonic beings from their prisons either accidentally or on purpose. It's all a coincidence, but when patterns start turning up like this, it makes me wonder if I'm being warned about something by "the other side". Hallowe'en is definitely a time when all sorts of nastiness could be unleashed so be careful with those ouija boards, chalk circles on the floor, or trying to pull standing stones out of your field with a tractor. Anyway, this post is just a recommendation for the movie which I use as the divider between what I find acceptable to watch and what I deem to be complete crap. If a movie looks worse than "Rawhead Rex", I kid you not, I will throw it in the bin without watching more than 5 minutes of it. 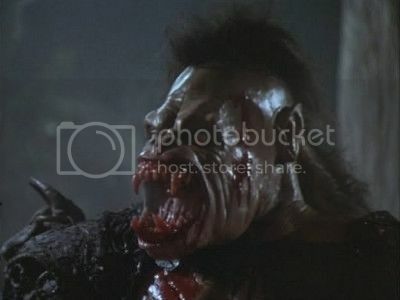 Having said that, "Rawhead Rex" doesn't look particularly bad to me. It's obviously low-budget, and Rawhead is just some guy in a badly made ape costume like the ones in "2001: A Space Odyssey" (which is highly overrated, boring beyond human endurance, and absolute crap), but the camerawork is decent. Clive Barker might not like "Rawhead Rex", but I don't really care what he thinks about anything after seeing what he has on his Tumblr page. Trust me, you do not want to check that out no matter how curious you may be. I really like the "Rawhead Rex" story, the Irish setting, and even some of the characters. The late David Dukes as Howard Hallenbeck is pretty good, Kelly Piper has a few decent moments, and, of course, Ronan Wilmot as the nutty Declan O'Brien stands out way more than anyone else just because he's awesome in the part. Thankfully, even though "Rawhead Rex" appeals to those retarded folks who would laugh to see a pudding crawl, it's not a comedy. 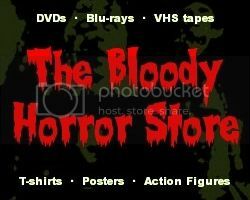 There are a couple of genuinely disturbing moments, and it definitely doesn't pull any punches when it comes to gory kill scenes. Considering the budget and the time it was made, "Rawhead Rex" is probably the best monster movie from 1986 (other than "The Fly"). If you don't believe me, just go back and rewatch them. Nobody had anything too brilliant in the way of practical effects that year. As usual, when it comes to these ridiculously overpriced OOP DVDs ($299 for "Rawhead Rex" on Amazon? I think not! ), I've embedded the movie from YouTube at the top of this post so you can watch it for free. Enjoy!